The 2001 reunion was held Saturday, June 23. It was held at the Dyersburg Activity Center at 1101 Shelby Drive, Dyersburg, TN. This was the place we used for the previous Dyer reunion. It was a good location with good places for the children to play. Pat Blalock, Janet Cagle, and their families handled the local arrangements. On Friday evening, many of the out-of-towners and some locals congregated at the Hampton Inn to visit. A large group went to eat at Neil's Barbeque, and returned for some more visiting and viewing photo albums. About 70 people attended the reunion on Saturday. Most were from the area. Fewer were from out-of-town than at previous reunions. Many people had intended to come, but illnesses, deaths in the family, and other special commitments prevented some of the regulars from attending. The largest representations were from Isabella's, Israel's and Robert's families. Other lines represented were Ann and Viney. A tour was held the afternoon of the reunion after the reunion closed down. 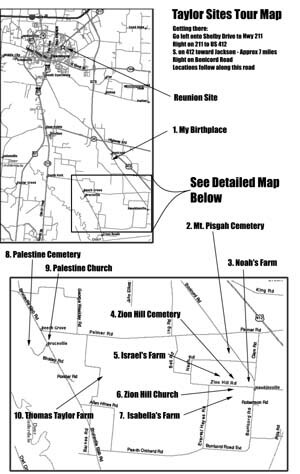 We visited sites associated with Isabella, Noah, and Israel, along with sites related to Thomas Carter Taylor, the son of Robert that moved to the area. The tour guide document is included here. On Saturday night a sizeable group of out-of-towners and locals went to Reelfoot Lake for supper. We ate at Boyette's dining room on the lake, a local landmark. We feasted on all the country ham, catfish, or chicken we could eat. Most were uncomfortably stuffed after the meal and had highly elevated cholesterol levels. Some of us who were there on Sunday attended services at Palestine Methodist Church in Bruceville. This was the home church for Thomas Carter Taylor's family. His descendants are a big portion of the Taylor clan in the area. When you click on the above icon, you will see the photos stored with Picasa Web Albums. You don't need any software to view them. The Web Album shows you a view of all of the photos in thumbnails. You can double click on each one to see individually and you may select "Fullscreen" to see maximum size. From the individual view you can browse through the images as well using the control arrows shown. You may select also slideshow mode. You can download any photos you want individually. Picasa has free PC software that helps to manage photos on your PC and connects to and manages the Web Albums those you store online. You can get the free software at: http://picasa.google.com/ It’s a pretty good tool, even if you just use it for managing the photos on your PC. If you have Google's Picasa on your PC, you may download the entire album to your PC with one command. Just click on "Download" and "Download to Picasa." You'll then have a copy of the eitire album in a folder on your PC. The names in brackets [ ] give the generations. © 2002-2010 Miller Taylor. All Rights Reserved.